After the sugary delights of the World Twenty20, it’s back to the slightly more balanced diet of 50-over cricket for the West Indies and India with the four-match ODI series which starts tomorrow at Sabina Park. The tourists have been hit by injury (Sehwag, Raina) as well as the desire to give some key players (Tendulkar, Zaheer Khan) a rest, but a ‘weak’ Indian side still contains the likes of Yuvraj Singh, Ishant Sharma and Gambhir. Whilst their performance at the World Twenty20 was a disappointment, a disappointed India often bounce back strongly, and the inclusion of fresh faces may well prove to be the catalyst for a revival of their fortunes. Dhoni, as ever, will be key. 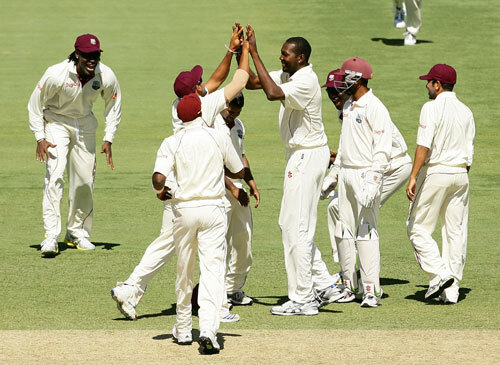 For the West Indies, an encouraging home Test series (at least in terms of results, the WICB‘s reputation took a bit of a beating) against England was followed up with a seemingly jaded performance against the same side away from home, and the contrast between the Chris Gayle who grumbled and griped his way thought that series and his swashbuckling Twenty20 alter-ego was vivid. The Windies will be hoping that they have the latter at their disposal for the next couple of weeks, as well as his partner-in-boundaries Dwayne Bravo (who is joined by brother Darren in the West Indies side for the first time). Sulieman Benn is also likely to have to play at his best, as he will face a tough examination of his bowling from the side who are traditionally considered the best in the world at playing spin. 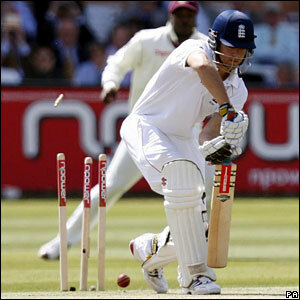 Ravi Bopara grasped his chance at number three with both hands whilst all others fell about him. 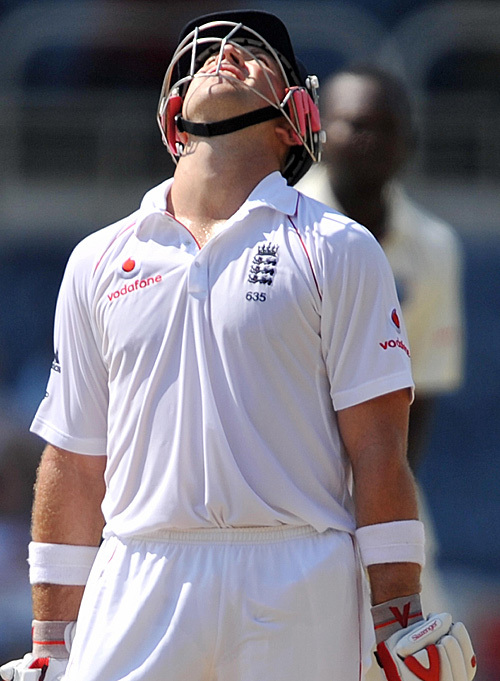 Strauss (who was crowned England’s best player of last year before the start of the match) made just 16; Cook did his usual of getting in and getting out; Pietersen was out first ball as his disappointing IPL form spilled over into the English ‘summer’; Collingwood didn’t get out of single figures; Prior and Broad both battled beside Bopara but didn’t hang around for long enough (although in Broad’s case he probably lasted longer than his batting deserved); and Tim Bresnan made about as many (and as few) as those who have never heard of him may have expected. For the tourists, Fidel Edwards took 4-53 (and might have had another two or three but for some dropped catches) and Sulieman Benn took a couple as well. If Bopara can hang around tomorrow morning and shepherd the tail, then England can make a decent enough score, but I shudder to think what Australia would have done to this batting line-up. 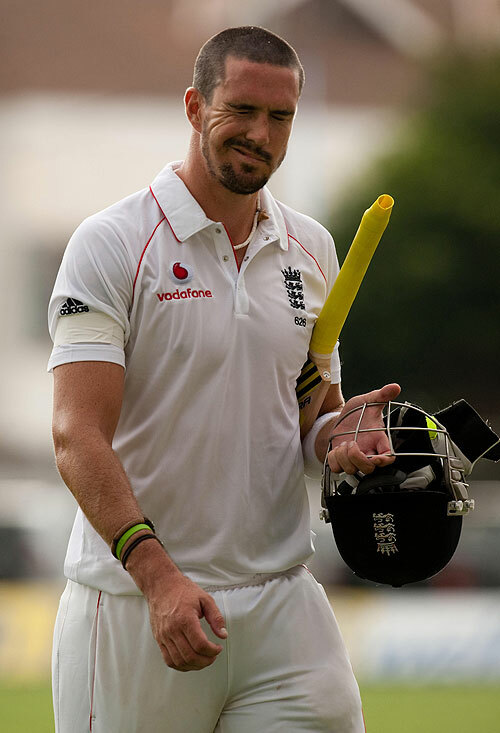 After a brief interlude which many of the players involed spent playing (or bench-warming) in the IPL, England and the West Indies go toe-to-toe for the second time this year with the Test series starting tomorrow. The Windies, of course, were hastily lined up as replacements for first Zimbabwe (who were banned from touring the UK for political reasons) and then Sri Lanka (who decided they preferred the IPL millions and to getting rained on in May in the UK), but have proven themselves formidable opponents for England, winning the series in the carribbean after a memorably awful performance from the English batting order. For the hosts, thoughts are already drifting towards this summer’s Ashes series, and many of the squad will be looking to stake their claim for a spot in the side to face Australia. Ravi Bopara gets his chance at number three, on the grounds that everyone else is either too young, too old or too rubbish. Tim Bresnan and Graham Onions are the other new faces as Andy Flowers tries to liven things up a bit. The absence of Flintoff means there will be opportunities to shine for the young bowlers, but it will take something special to guarantee an Ashes place. The West Indies haven’t had the best of preparation, being soundly beaten by the England Lions in the absence of their captain (who seemingly shares the Sri Lankan’s preference for the IPL over the UK), but their performances over the winter will have brought encouragement. As ever, Gayle and Chanderpaul are the danger men, but the likes of Fidel Edwards and Sulieman Benn also gave England plenty to worry about last time around. Anything less than a series victory for the hosts will be seen as catastrophic, but catastrophe has befallen England so often recently that it’s difficult to rule out another abject failure from the home team. There aren’t many 6’7” spin bowlers out there, so Sulieman Benn (one of my ones to watch way back in March) stands out regardless of his performance. He stood out in another way during England’s first innings of the First Test at Sabina Park, though, namely the quality of his bowling. For a spin bowler to bowl 22 overs on the first day of a Test in Jamaica is remarkable in itself, but for him to only concede 29 runs (and take the wicket of the other side’s best player) is pretty special. He continued his good form on the second day, too, taking another three wickets (including those of Collingwood and Prior, both decent players of spin) to finish on figures of 4-77 (and with an economy rate of 1.73). It seems the West Indian attack, once so famous for its pacemen, has a new element – one that England’s batsmen have, in the main, so far stuggled to cope with. It’s been four months since I plucked these eleven young cricketers from various levels of obscurity and cursed them with the tag ‘ones to watch’. How have they been getting on? Nasir Jamshed is on Pakistan’s probables list for the Champions Trophy, and made an unbeaten fifty against Bangladesh in the Asia Cup. 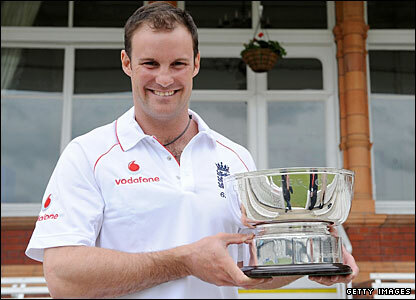 He’s also earned the favour of Misbah-ul-haq, which should stand him in good stead for the future. Virat Kohli has also been included in his country’s probables for the Champions Trophy, and has been awarded the Border-Gavaskar scholarship which will allow him to train at Cricket Australia’s Centre of Excellence in Brisbane for six weeks. Tamim Iqbal is over in England at the moment with Bangladesh A, but there hasn’t been much news of him recently. Hopefully there will be more to report soon. Fawad Alam made some runs in the Asian Cup, but his bowling hasn’t been very good of late. He’s likely to struggle for inclusion in the Pakistan side whilst Afridi is around. 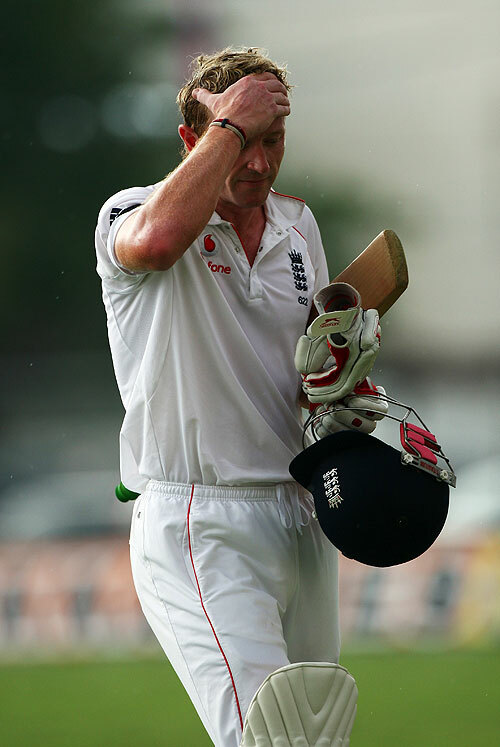 Steve Davies scored 74 on Tuesday, and may still be under consideration by England’s selectors as a replacement for Tim Ambrose. Adil Rashid‘s fine bowling in the Twenty20 Cup was ulitmately scuppered by his team-mate’s lack of registration. 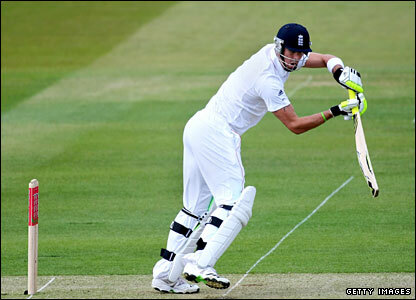 Not much hope of an England call-up unless Monty picks up an injury. Beau Casson hasn’t been included in Australia’s preliminary squad for the Champions Trophy, and opinion is still a bit divided on how special or ordinary he really is. Sulieman Benn has overcome the apparent West Indian anti-spin bias to show some promise whilst going for quite a lot of runs, but he needs to play more cricket against sides that aren’t Australia before he can be properly assessed. Tim Southee bowled quite well against England in the One-Day Series, and is still the most exciting young bowler in New Zealand. Ishant Sharma continues to take wickets, will soon be making an appearance in a Bollywood film, and is one of India’s most eligible bachelors. 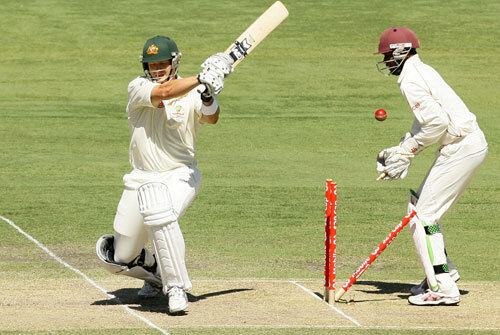 Mitchell Johnson has shown flashes of brilliance, but had an ultimately disappointing Test series against the West Indies. Another one who needs more top-level cricket before a verdict can be reached.